For those that "escaped" to warmer climates on this vacation week. The graphic that accompanies this blog is for you. Not only one for the books here, but dozens of record high temperatures fell across the Northeast. As of this typing, the number was up to 59. While it's always difficult to pin a single event on climate change (and weed out what would be normal variation), I would say this current warm spell certainly has the fingerprints all over it. We'll make another run at a record in Boston and Worcester tomorrow. 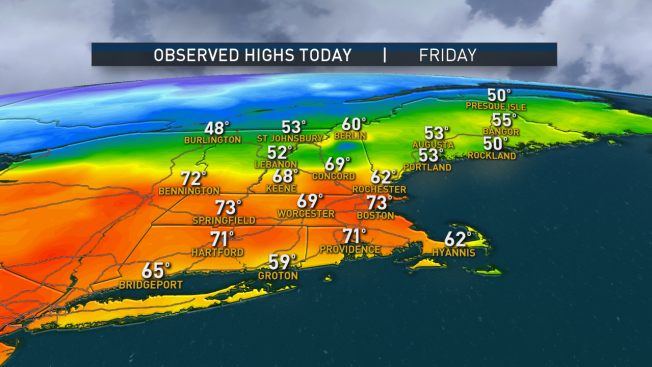 Highs won't soar into the 70s, but 60s will do just fine. Southeast winds will come off the water, but the air will be warmed by dewpoints in the mid 50s (also out of season). Showers will sprout in the afternoon with downpours - and a scant chance at a thunderstorm in Northern Mass and Southern NH - in the afternoon and evening. Highs Sunday will be much cooler, but still not wintry or (giggle) arctic. There are virtually no cold reserves built up over Canada, and only a small pocket of bitter air in Alaska - not much to go around. Eventually, some colder air will work into the picture late next week, but not after we make a couple of passes near 50 early and mid next week. Winter's not entirely over, folks, but it's on life support.